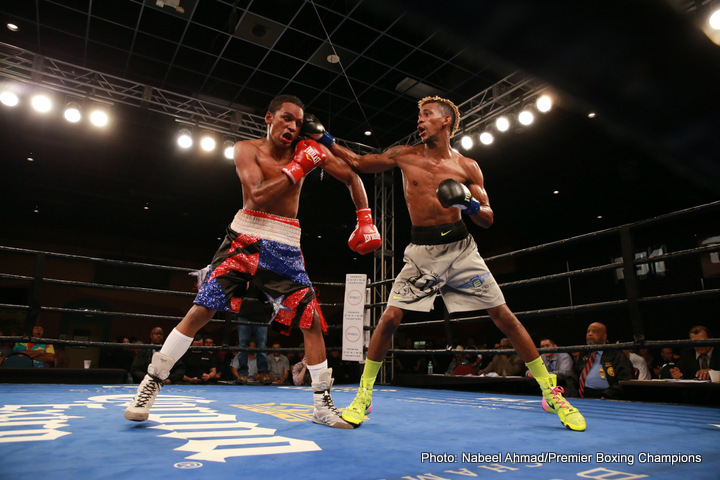 Undefeated Cuban prospect Leduan Barthelemy (13-0, 7 KOs) scored a ninth round stoppage of Reynaldo Blanco (14-4, 8 KOs) Tuesday night in the main event of Premier Boxing Champions TOE-TO-TOE TUESDAYS on FS1 and BOXEO DE CAMPEONES on FOX Deportes from Robinson Rancheria Resort and Casino in Nice, California. 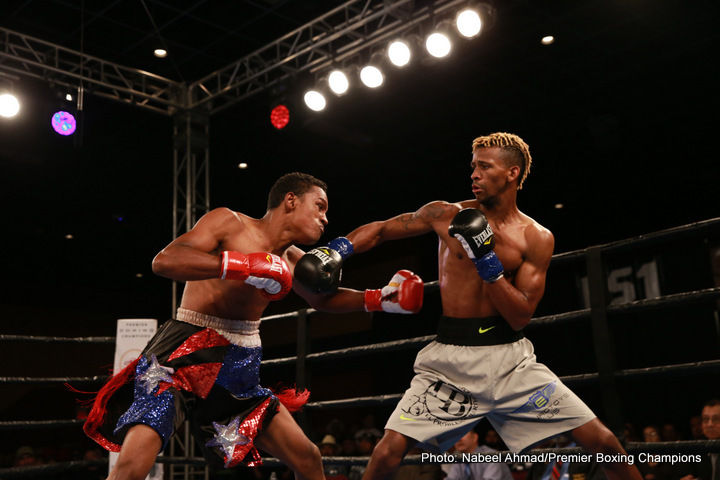 The brother of two-division world champion Rances, Barthelemy showed off his boxing skill by using his length and speed to dictate the action against Blanco. After a slow start, Blanco came alive in the third round and began increasing his offensive output, including a looping right hand that landed clean on Barthelemy’s head late in the round. 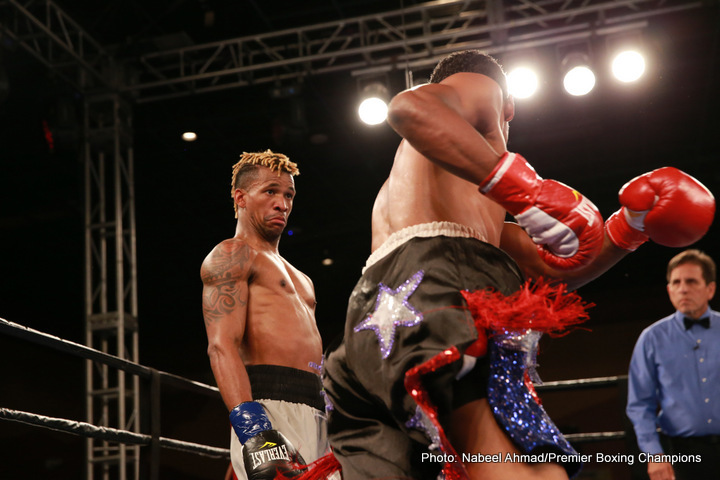 Blanco again pushed the action in round four and landed a sharp left hook, but Barthelemy took the shot and responded with a right hook of his own to end the round. 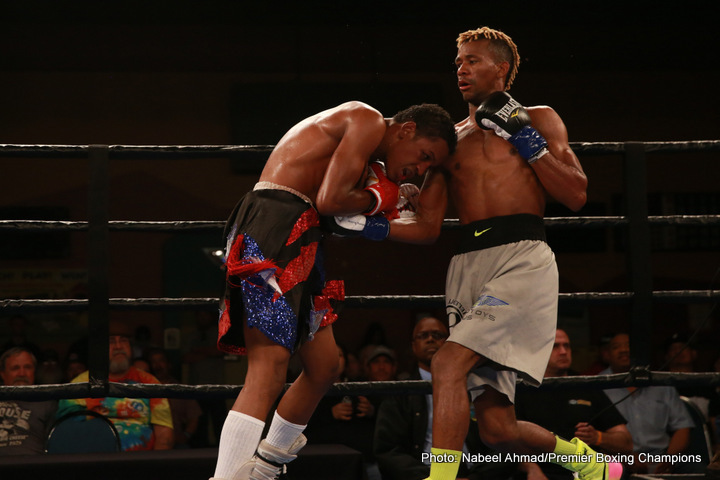 Barthelemy continued to have success with his jab, and throwing combinations off of it, and eventually opened up a cut over Blanco’s right eye at the end of round eight. 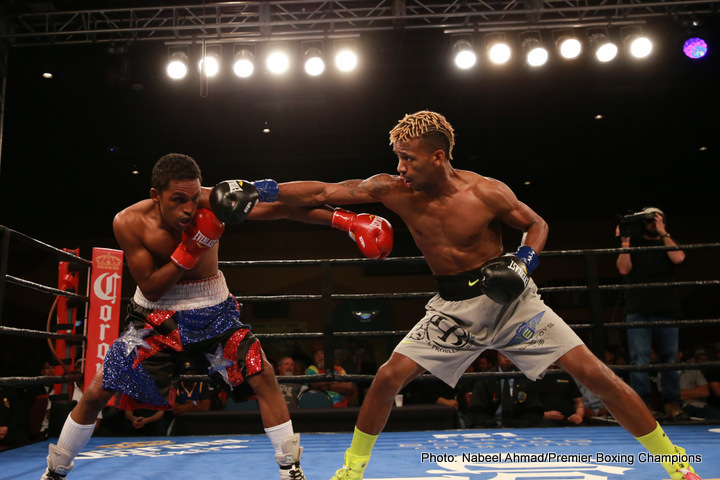 Barthelemy was the fresher fighter as he entered the ninth round for the first time in his career and it showed as he dropped Blanco with a series of hard right hands early in the ninth round. Blanco was able to get to his feet but Barthelemy continued the onslaught, prompting Blanco’s corner to stop the fight at the official time of 1:30 of round nine. 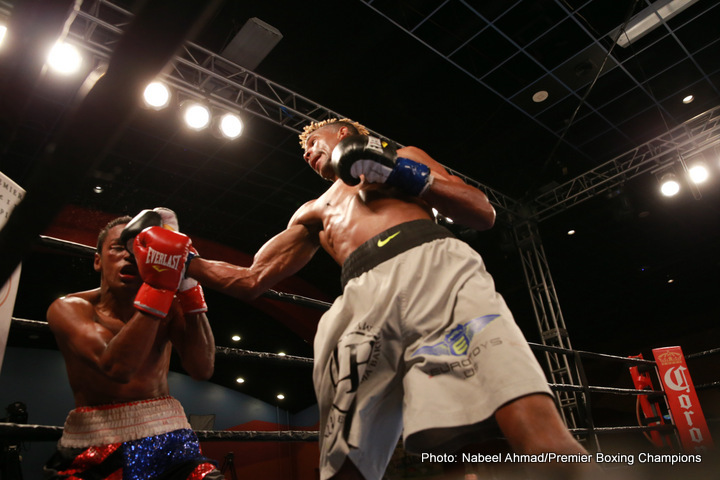 The co-main event of the night saw Delaware’s Kyrone Davis (12-1, 5 KOs) earn a split-decision victory over previously unbeaten Marcos Hernandez (9-1, 2 KOs) in a 10-round showdown of super welterweight prospects. Davis came out aggressive from the start as he looked to close distance and attack Hernandez from the inside. It nearly backfired early as Hernandez wobbled Davis with a left hook and followed up with a right uppercut that put Davis in some early trouble. The tide swung back towards Davis after the first two rounds with an increased attack to Hernandez’s body, which slowed down the offense of the Fresno-native. In round seven, a stray body shot from Davis was deemed low by referee Dan Stell, who deducted a point as Hernandez dropped to the canvas. Despite the deduction, Davis was able to remain effective with his aggressive game plan as both fighters went past eight rounds for the first time in their pro careers. Hernandez appeared to hurt Davis midway through the final round with a left hook, but Davis was able to smother Hernandez as he went for the knockout. After the end of ten rounds the judges awarded Davis a split decision by scores of 95-94 for Hernandez and 96-93 twice for Davis. 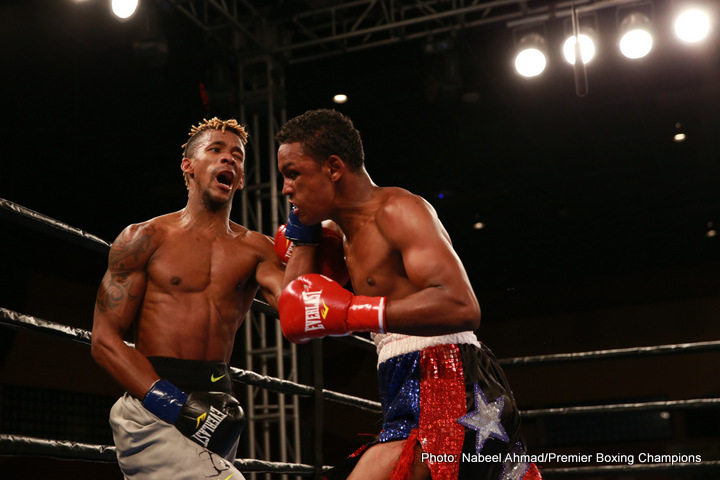 In the televised opener, unbeaten prospect Malcolm McAllister (9-0, 8 KOs) overcame a knockdown in the final round to earn a unanimous decision over Mexico’s Alejandro Torres (9-2-2, 4 KOs) in their six-round super welterweight clash. McAllister was in control of the fight throughout the first five rounds using his jab to control the distance and beat Torres to the punch consistently. He began landing more strong right hands in the third round and continued to box effectively while building a lead on the scorecards. The fight changed drastically early in the sixth and final round as Torres got the better of an exchange of power punches and connected with a massive left hook that stunned McAllister and sent him to the canvas. The Long Beach-native was able to get to his feet but was still shaky as Torres stalked him around the ring. With a combination of clinches, jabs and movement, McAllister was able to finish the round on his feet despite Torres’ advances. The knockdown was not enough to derail McAllister as he won the decision by the score of 58-55 on all three judges’ cards.